If you are the kind of person who likes DIY and sewing in one sentence, then scroll along because what we prepared for you are ten easy, adorable and affordable homemade summer – inspired sewing projects. From coasters to pillows, summer shorts to tote bags, here you will find anything that can be useful for the upcoming hot days or as your new home decoration. These colorful projects will definitely give the summer vibes you, your closet and home need. Have fun! With summer just around the corner, it means that the season of lemonades, iced teas and cold milkshakes is about the begin. To avoid all the stains on the furniture make your own coasters. These ones with their shape of a citrus are a real reminder of summer. 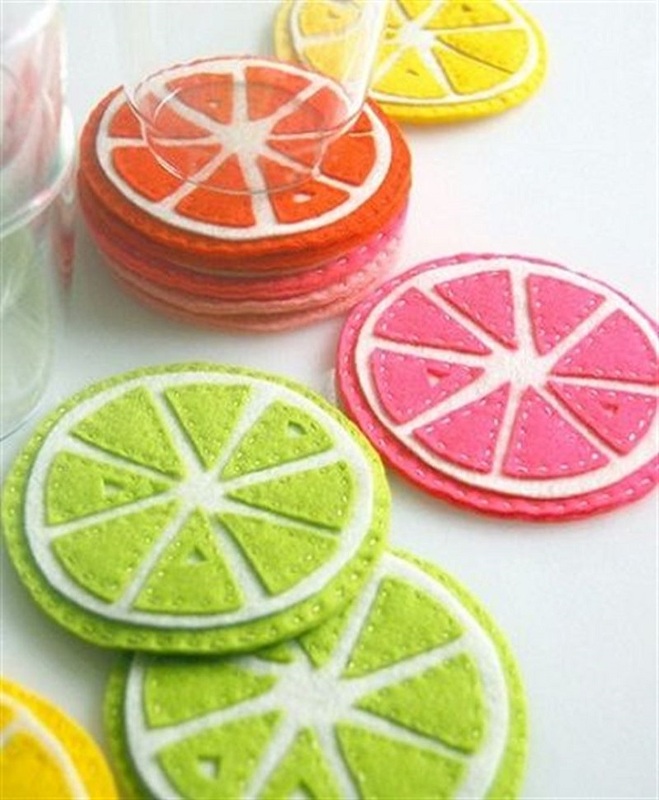 You need the following materials: sewing kit, colorful felt bundles, embroidery thread and citrus coaster template, that you can download for free on the website. You choose the colors, but having bright, summer-y colors like yellow and red will definitely do the trick. Going on a vacation means preparing yourself in advance. 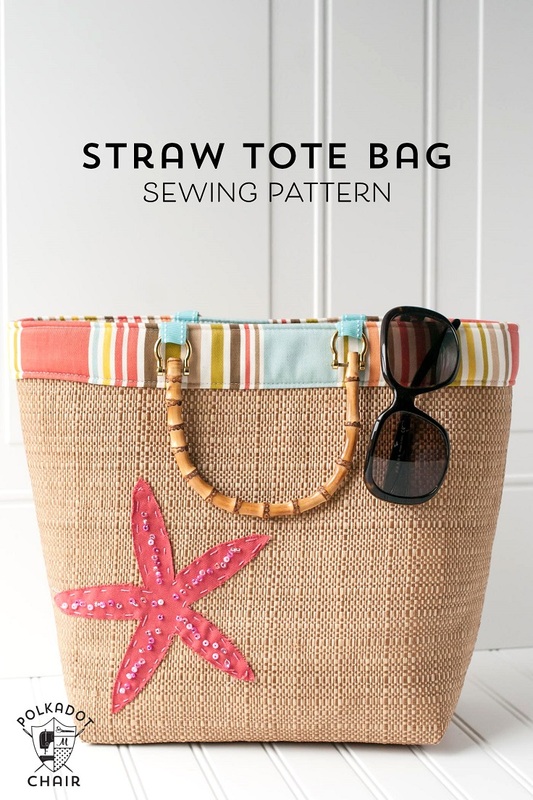 This means having a beach bag is a must, so if you’re planning to get a new one – check this one that you can make at home. The bag requires a little bit of more work and DIY knowledge, but even if you’re a beginner, it’s still worth the try. You need the following materials: 3/4 yard fabric-backed straw/raffia fabric, 3/4 yard fabric for lining, 3/4 yard fusible fleece, scrap of fabric for starfish, paper-backed fusible web, 1/2 yard of 3/4ʺ-wide ribbon, all-purpose polyester thread, size 90/14 Universal (all-purpose) or Jeans sewing machine needle, seed beads, cotton embroidery floss, hand-sewing needle, purse handles and walking foot. We all enjoy the sunshine and the warm weather, but we really don’t like is the sun in our eyes for longer period of time. It’s really distracting and it can be annoying as well! 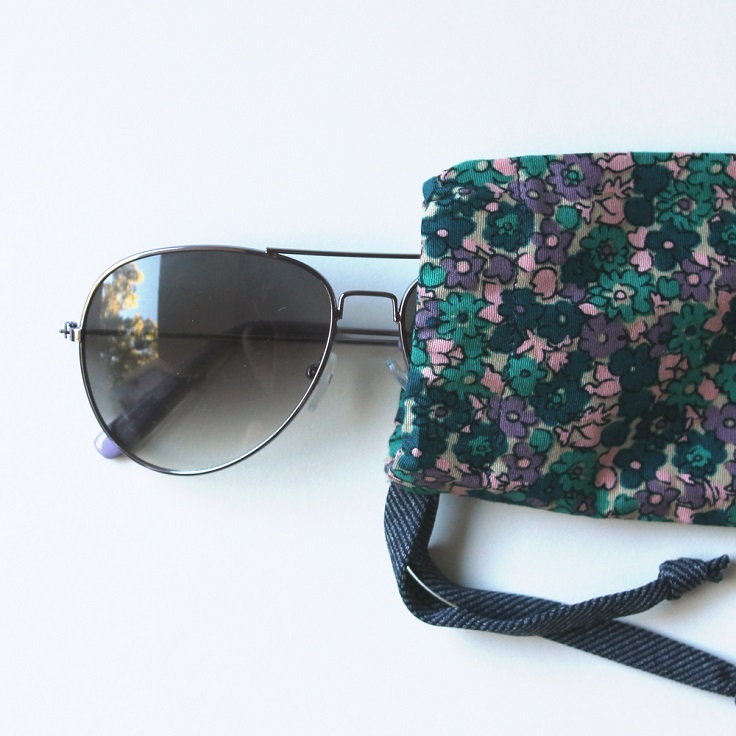 Of course, luckily here are the sunglasses to save the day, but if you’re the type of person who always loses them, maybe you should consider buying a sunglasses case, or even better – make your own. For that, you need the following materials: 1 pieces fabric 7.75 x 9.5 inches , 1 pieces ribbon or bias tape, cut 16 inches long, disappearing ink pen, thread, pins and safety pin. You can choose a floral fabric as pictured, but you can always experiment with prints and designs and choose something you like better. Hot, summer days mean that wearing less is desirable. Sometimes the heat is too much to deal with, so what we can do is stay somewhere cool, refresh ourselves with a cool drink and wear the proper clothes that can help us defeat the heat. For example, if you like shorts, then we hope that you are going to like this pair as much as we do. 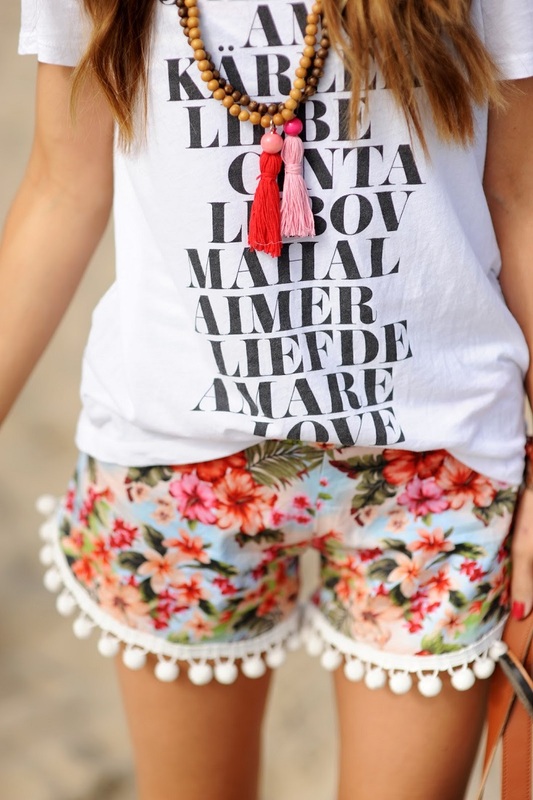 It’s a total summer-y look, plus the pom poms are such an interesting detail. 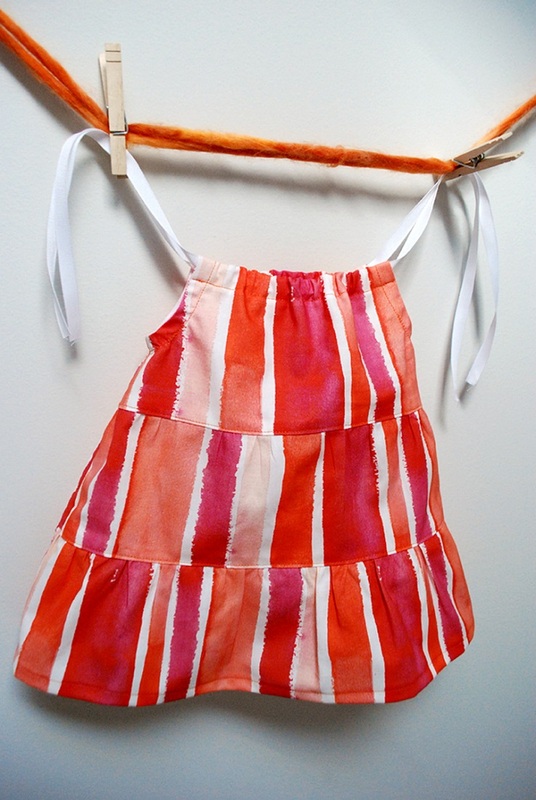 For this project you need at least basic sewing skills. You need the following materials: 1 yard fabric, you can use 100% cotton or whatever you’re comfortable in, matching thread and 1″ elastic. 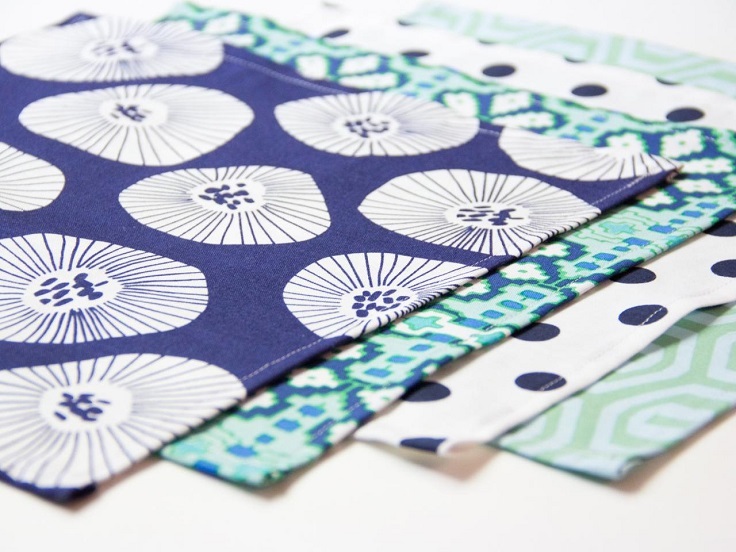 Making new cloth napkins is really and fun – especially when you’re choosing over hundreds of fabric prints. Floral, polka dots, geometric, there is literally something for everyone’s taste. After you pick the desired fabric, you need an iron, sewing machine and sewing basic materials. For this project, you just need basic sewing skills and even if you’re a beginner, going carefully through the tutorial will do the trick. The project is also budget – friendly, because the only thing you’ll need to spend on is the fabric (except if you don’t have the required sewing tools) and the best part of all is that it will take you just a day or even less to have it all done. 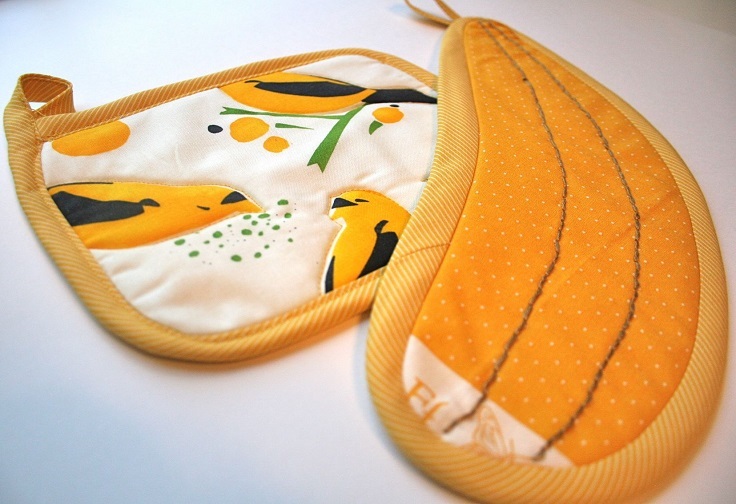 Having cute, pot holders can be the new decor in your kitchen. With that adorable holders, they won’t just serve you for the obvious reason, but can also be useful as a kitchen decoration, if being put the right way. This project is also a budget – friendly one, because again the fabric is the only thing you will have to spend some to buy. It’s easy and you can do it in a day or less. For detailed instructions, check out the link below the picture. Thinking about buying a new dress for your baby girl or other girl dear to you? Here’s how you can do it yourself. First of all make sure you have the needed materials and tools: kathy’s free tiered ruffle baby dress pattern – size 6 months (PDF, you can find it on the website via the link), 3/4 yard fabric, single fold bias tape, grosgrain ribbon – 3/8″ wide, thread, disappearing ink pen, good fabric scissors, glass head pins, totary fabric cutter, ruler and self-healing mat, iron and ironing board and sewing machine. Advanced sewing skills are needed for this dress project! 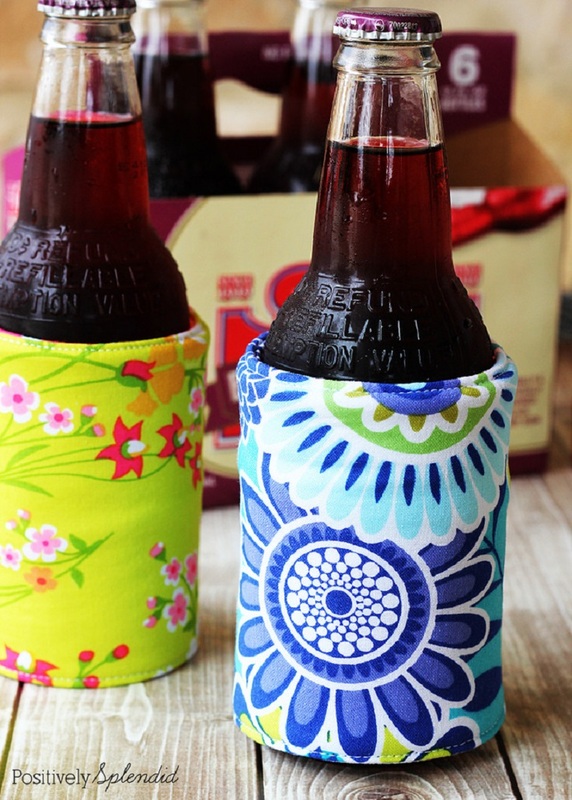 If you haven’t had any beverage holders, now it’s the time to and of course – to make your own. You need the following materials and tools: (1) 11×5″ piece quilting cotton (for the outer body), (1) 11×5″ piece quilting cotton (for the body lining), (1) 11×5″ piece Insulbright (a heavy duty insulated fleece, found with the interfacings and stabilizers), (2) 11×5″ pieces fusible fleece, (1) 4.25″ piece of 1.5″ Velcro, coordinating thread, point turning tool, denim sewing needle and basic sewing supplies: machine, iron, pins, etc. Budget – friendly, easy to make and useful – what more could you ask for? One of the best ways to make your home happier and prettier place to live in is to add small, but significant details. This pillow is a real example of how one small thing can be so charming! 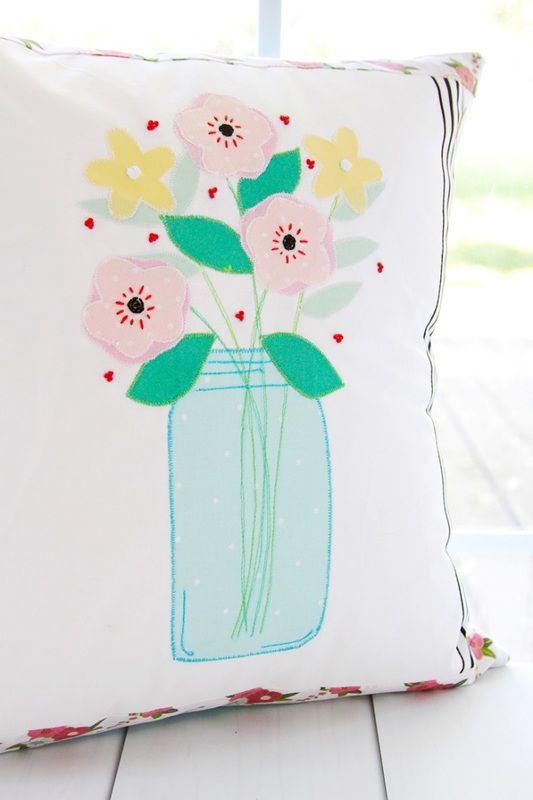 We fell in love with it, and in case you did as well, here’s what you need to make your own cute flower vase pillow: white fabric for pillow front – 14″ x 14″, assorted scraps for flowers, leaves and a piece for mason jar, small amounts of fabric for strips on the sides – each needs to be 2″ x 16″, fabric for backing – 16″ x 22″, embroidery stabilizer – 14″ x 14″, iron on fusible webbing, coordinating embroidery floss, disappearing ink marker, 16″ x 16″ pillow form, thread – white, two shades of green, and turquoise and Mason Jar Vase Patterns and Layout. 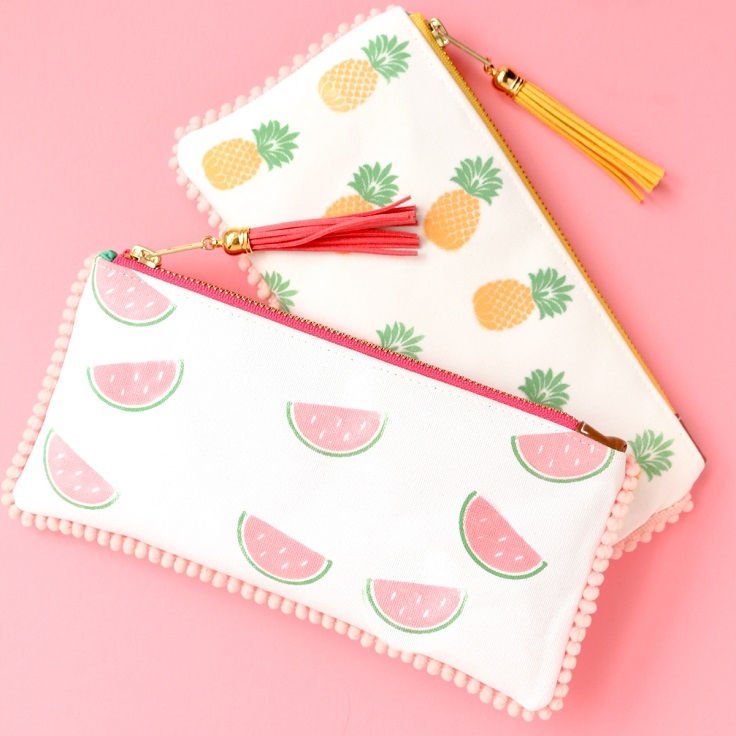 , Silhouette Ink in your fruit colors, Blank Canvas Zip Pouch (or zippers, canvas and a sewing machine if you want to make your own), pom pom trim and tassels, but this is optional. If you don’t have the exact materials and tools where you live, find and use an alternative.